I just wanted to say thank you again for all of your help during our move. Your flexibility on the timing was greatly appreciated and we could not have been happier with the level of service from you and your team. I would be happy to leave a review online wherever it would serve you best, so just let me know. Thanks again! I hired AFFORDABLE GREEN MOVERS to move my 4 bedroom house from Boston to Framingham. I have a lot of heavy stuff and stairs so I requested 3 guys and two 20 ft. trucks. Ed (the foreman) and his team did an AMAZING job!!! These guys showed up at 7:30am. and did not slow down until the work was finished. They worked so hard and so fast that they beat the "not to exceed price" by $400 and still showed extreme care with my stuff. All the guys were friendly and curious and I could not have been more pleased. Moving from one location where you lived for many years to a new location can be a difficult and a nervous process. All your worldly and valuable possessions that have been accumulated over the years may be in jeopardy Fortunately Affordable Movers takes away all your worries and concerns. Ed Santos, the manager and owner of Affordable Movers takes great care insuring the safety and care of your prized possessions. He accompanies and supervisors every move. Unlike other moving companies, Ed before your move, visits at your home or business, to determine beforehand the task that lay ahead. Any questions before the move can be answered to determine the cost, any concerns about fragile items and date, time and place the move is to take place. I am stating the facts that I have experienced as an individual who has lived for 29 years in Metro West at the same location and recently moved to a Condominium. Ed outperformed my expectations without a single item broken,dented.or damaged. 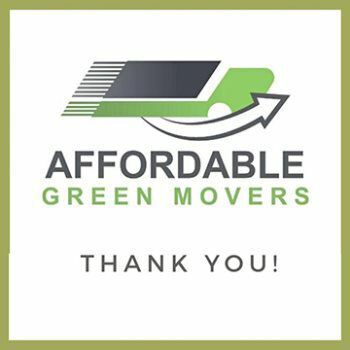 I personally thank Affordable Green Movers owned and operated by Ed Santos for a job well done!